Magnesium Advocacy Group — What you don't know about Magnesium might kill you. I started this website, GotMag.org, in 2012 in response to a widespread lack of awareness about the prevalence and influence of Magnesium deficiency. I knew that Magnesium deficiency was tied to all major health problems based on my research of the peer-reviewed scientific literature from around the world. 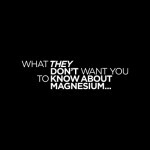 But since then, further research has lead me to discover that for many, Magnesium alone isn’t enough. Please visit The Root Cause Protocol to find all the updated content. PS – In the meantime, even though all of it can be found on the new website, I’ve decided to leave many of the original GotMag.org pages online as an archive of my work-in-progress research (circa 2012 – 2017) and in case there are other websites pointing to these various pages.